Over 500 lots of World class whitetails ,Elk heads, Caribou, Black Bear Rugs, antelope, small animal mounts, whitetail shoulder mounts, lots of large whitetail sheds and European mounts. Checkout Date & Times: If items are not picked up at the auction facility by noon Feb 9 they will be moved off-site and will have to be picked up by appointment only. They will be available at 8048 Chestnut Ridge Road, Beach City, OH 44608 until Feb 28. All accounts must be settled at the conclusion of the auction. We accept Visa and MasterCard. Your credit card that is on file with Proxibid will be charged at the conclusion of the auction for the following: Your Purchases, Buyer's Premium of 15%, and applicable sales tax. A pre-auction authorization will be performed to establish available credit. Debit cards may show a hold on funds for a short period of time. Nothing will be charged to your card until a purchase is made. Credit card chargebacks will not be accepted. Invoices will be posted within 24 hours of the close of the Auction. Please check our website for updates on our auctions: www.stevechuppauctions.com. All sales are final. Items are sold AS-IS, with no warranty expressed or implied. It is the bidder's responsibility to determine condition, age, genuineness, value or any other determinative factor. Steve Chupp Auctions may attempt to describe the merchandise in advertising, on the Internet, and at the auction but makes no representations. In no event shall Steve Chupp Auctions be held responsible for having made or implied any warranty of merchantability or fitness for a particular purpose. Bidder shall be the sole judge of value. No shipping offered by the auction company. If the buyer needs an item shipped that is solely the responsibility of the buyer. Pick-up by February 28, 2019, NO EXCEPTIONS!! If items are left past the pick-up date, those items are forfeited by the buyer and will become the property of the Auction Company. By registering to bid or placing a bid Bidder agrees to be bound by all of these terms and conditions and any other announced terms and conditions of sale or rules of the site. All internet bidders agree that bids placed on the Internet shall have the same legal effect as if they were in attendance at the auction in person. Bidders who bid from off-site and are not present at the live auction or preview understand and acknowledge that they may not be able to inspect an item as well as if they examined it in person. It is the Bidder's responsibility to determine condition, age, value or any other determinative factor. Steve Chupp Auctions shall endeavor to describe in detail each item and any pertinent information about it. Steve Chupp Auctions is providing Internet pre-auction and live bidding as a service to the bidder. Bidder acknowledges and understands that this service may or may not function correctly the day of the auction. Under no circumstances shall the bidder have any kind of claim against Steve Chupp Auctions or anyone else if the Internet service fails to work correctly before or during the live auction. 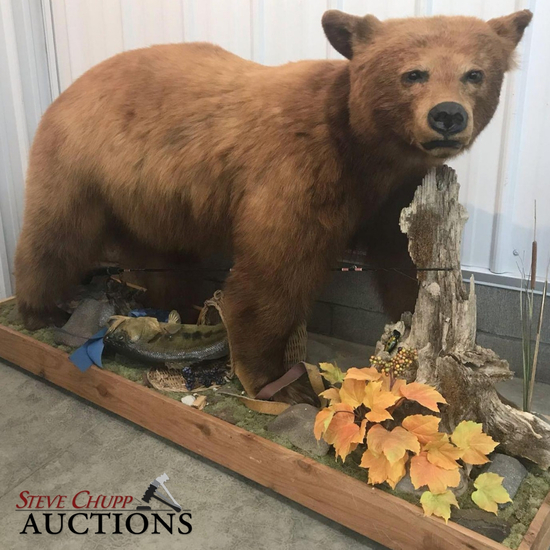 Steve Chupp Auctions will not be responsible for any missed bids from the source. Internet bidders who desire to make certain their bids are acknowledged should use the proxy-bidding feature and leave their maximum bid 24 hours before the auction begins. Steve Chupp Auctions reserves the right to withdraw or re-catalog items in this auction. Steve Chupp Auctions reserves the right to accept or reject any and all bids. Steve Chupp Auctions may refuse a buyer's number to anyone for any reason. Bidder agrees to comply with any stated additional terms or conditions associated with any particular item.